The 'Prayer-Wish Purification Ceremony for Restoration' was held from 8:00 pm at the Tree of Love plaza on the 2nd Day of the Purification Azalea Festival. The Prayer-Wish Purification Ceremony for Restoration is a time to offer the Fulfillment of Wishes Papers (Wish Papers) written by the members from around the world to heaven and at the same time removes the memory of sins of our blessed ancestors from their life on earth and in the spirit world. The ceremony also removes the strongest resentful spirit in our body. 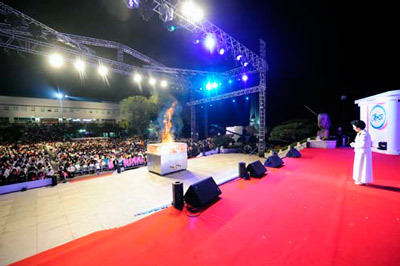 The 'Resolution Form for a New Beginning' which was written as a condition for the Cheon Il Guk Foundation Day Registration Blessing Ceremony was also burnt during the Holy Burning Ceremony. The emcee for the event was Rev. Myeong-gwan Lee, General Director of Chung Pyung Heaven and Earth Training Center who opened the event at the opening address saying, 'It is the first Special Great Works after the Foundation Day and there will be great grace by Heavenly Parents and True Parents of Heaven, Earth and Humankind.' Then there was an introduction to distinguished guests; President Yeong-hui Kim, Rev. Chang-shik Yang, General President of FFWPU-Korea, Rev. Yeong-cheon Song, General President of Unification Movement in Japan, and etc attending the Burning Ceremony. There was a performance by the Gyeong-gi Area Dance Group who performed traditional Korean fan dance and drum dance. Then there was a commemorative video that showed the value of Chung Pyung Works and deepened the seriousness of the Prayer-Wish Purification Ceremony of Restoration. After the representative prayer offered by Rev. Jeong-su Kim, Ganwon Region President, there was a congratulatory song was sang by La Strada, a team organized by Professor and vocalist Miran Kim, a 2nd generation from Sun Moon University. Then there was the entrance attendance of 14 pairs onto the stage. The attendance represent the gates to heaven passing the sincere wishes and hearts of all the members from around the world to heavenly parents and True Parents of Heaven, Earth and Humankind. Then representing the attending members, Rev. Yang Ho, President of Pacific Special Region, came to the stage to read the 'Words of Gratitude to Heaven' which expresses the gratitude of all the members for the wishes to be granted. Then it was finally the entrance of Dae Mo Nim. Dae Mo Nim lead the Chung Pyung Works for over 18 years under the special instruction by True Parents of Heaven, Earth and Humankind. Then there was the offering of Fulfillment of Wishes Papers by 12 church leaders (Korea, Japan and International pastors). The boxes of Fulfillment of Wishes Papers and the Resolution Form for a New Beginning was installed into the altar through the hands of Dae Mo Nim. Then Dae Mo Nim passed the holy fire to the 4 igniters, representatives and elder blessed families, who ignited the altar together. The holy fire reached over 3 meters above the ground. It was a moment where the wishes and prayers of all the members filling the plaza reached to the heavens. The families all shouted, 'Heavenly parents, True Parents of Heaven, Earth and Humankind, Heung Jin Nim and Dae Mo Nim, Gamsahamnida!'. It was a very special moment for people to be reborn through burning the Wish Papers and Resolution Form for a New Beginning. There was a time for all the members to offer a unison prayer where all the members prayed really hard and loud with Dae Mo Nim. After the unison prayer, Mrs. Reiko Sakai came to the stage and sang 'Amazing Grace'. Then the Korean students from Sun Moon University and Japanese students performed two traditional dance which raised the atmosphere of the Prayer-Wish Purification Ceremony for Restoration. Then at the end, Rev. Yung-hwa No, Region 7 leader of Japan came to the stage to offer 3 cheers of Eok-manse. The Prayer-Wish Purification Ceremony for Restoration ended with a commemorative photo taking with Dae Mo Nim.